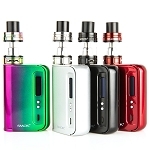 The Smok Priv V8 60W TC Starter Kit is a slim and compact vaporizer for use with liquids that makes the perfect choice for those who in the market for a lightweight travel-friendly vape. 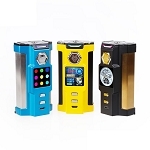 This single 18650 device utilizes a direct voltage based output that will automatically adjust it's power output to match remaining battery life, unlike most other similar devices Smok's Priv V8 is capable of supporting up to 60W of power with the 0.15 ohm coil. Smok Tech has quickly become well-known for creating vapes that look as great as they perform, this one being no different you can pick up your new Priv V8 60W TC Starter Kit in several different two-tone color schemes that are sure to impress. 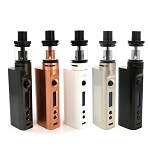 Please note the Smok Priv V8 Starter Kit requires a single high amp 18650 battery that does not come included with the vaporizer. If you need to purchase this item you can include it with your order by selecting the Add 18650 Battery option above, if you have any questions about this product please contact our customer service line during normal business hours for assistance. I've had a smok vaporizer in the past- very reliable and sturdy. Dropped it several times, and it keeps on going. Great that you can replace the battery in this model. Really cute too.